For cities considering adopting and implementing a 100% renewable energy target, there are many pathways available and uncertainties around which policies, technologies, and resources to put in place. While each municipality has its own local social, political, economic, and environmental context to take into account, a number of trailblazing cities with ambitious or 100% renewable energy targets are rapidly learning what works and what doesn’t when it comes to ambitious energy planning. 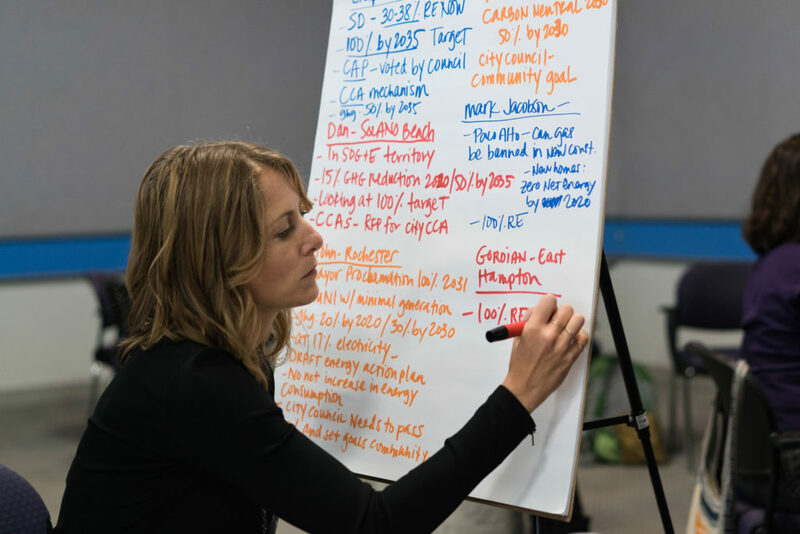 In July of 2016, Renewables Cities together with the Sierra Club, ICLEI USA, and the City of San Francisco Department of the Environment, brought together a group of 20 local governments from around the USA and Canada to learn and share ideas on how to transition to 100% renewable energy. Leading and learning cities—from Denver to Chicago, from Vancouver to Rochester—arrived in San Francisco for the three-day dialogue to hear about a range of new research and tools and to work collaboratively on policy solutions through a facilitated dialogue process. Participants included mayors, councillors and supervisors, energy managers, engineers, planners, sustainability directors, and economic development officers. Along with these local government leaders, we brought together companies that are implementing 100% renewable energy, including Apple, and that are helping municipalities reach their 100% RE goals, including Google’s Project Sunroof. Groups such as the National Renewable Energy Laboratory and Carbon Neutral Cities Alliance also participated and showcased their tools and best practices. 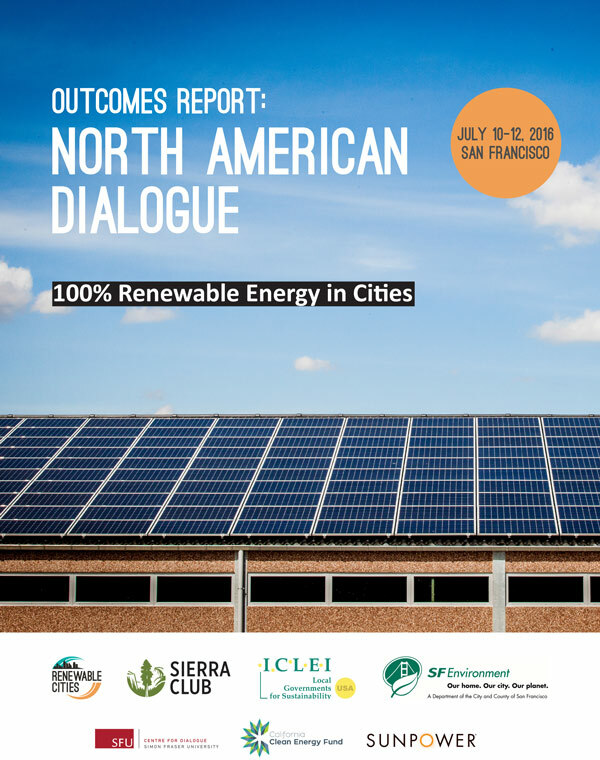 We’re proud to release the Outcomes Report from the North American Dialogue on 100% Renewable Energy in Cities and would like to thank the California Clean Energy Fund and Sunpower for supporting this dialogue. Download the Outcomes Report in web or print versions (PDF). For more information, including resources, presentations, photos, and blog posts, see the dialogue website.